On Thursday, Film director Mr. Ruchin Veena Chainpuri organised a press conference in Lazeez Tandoori, Grand plaza , Frazer road . 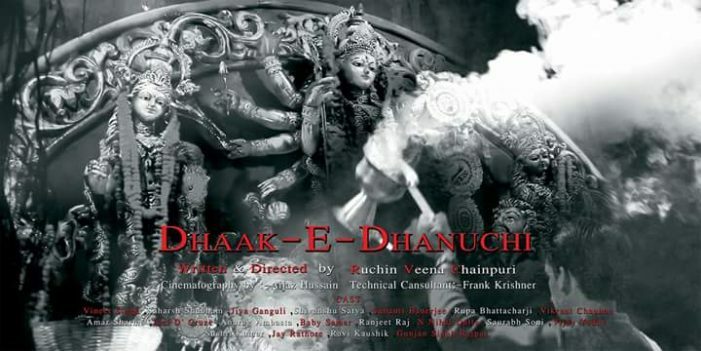 Press conference was organised for the launch of a feature film Dhak-e-Dhanuchi. The story of the film revolves around the life of statue maker .Statue maker plays a very important role from one month before the Durga pooja. He does not make only one idol , but he makes more than 50 idols and gives life to them. Somehow he gets emotionally attached to his crafted work. But one day, all of the idols are moved to the temples (pandals) made for pooja . People worship them for ten days. At the last day of pooja, all the idols are immersed by the people. This makes the statue maker emotional. In the film , besides a statue maker , there is one another parallel character of a IPS officer and both the stories merge together at the climax of the film . Film is produced under the banner of Cosmo Production . The film is going to be shoot in Patna , Deoghar and Kolkata. The cast for the film is Vineet Singh , Saharsh Shubham , Shivanshu Singh Satya , Jiya Ganguli , Shampa Chatterjee, Subanti Banerjee , Vikrant Chauhan , Ravi Kaushik , Ranjeet Raj , Sushil Kumar , Vijay Yadav , Anup Kumar , Rubi Khatoon , Amar Sharma , Nihal Kumar Dutta , Shambhavi , Jai Singh , Akash Francis , Baby Samar , Rajveer , Gunjan Singh Rajput , Shivam Singh and Uddeshya Raj . Technical Director and Media Advisor is Mr. Frank Krishner, Cinematographer is Mr. Aijaj Hussain . Lyrics is Composed by Neeraj Kumar and Prachi Mathur . The Director said “shooting for the movie will start from 9th of September , and is hoped that we will end the shooting by December 2018 and all the post production process is supposed to be completed till April 2019. Various artists from Patna’s theatre circuit and few selected talents from St. Xavier’s College , Patna will be preforming the key roles in the film, he added”.